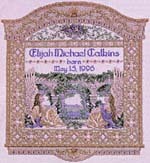 Model stitched on: 28 count antique white Monaco from Charles Craft, Inc.
Model size: 13.75" x 12.5"
Description: A birth announcement featuring a pair of seated angels flanking a vine-draped collonade which frames idyllic scenery. A wide decorative border accented with specialty stitches, beads and metallic cord completes the design. An over-one alphabet is included to personalize the piece. Background Information: I'd wanted to design a birth announcement for a long time, but lacked the proper inspiration. When I found out that my sister was expecting, the idea finally came together. When the long awaited day finally arrived, and my nephew, Elijah, was born on *my* birthday, a date I already share with my grandmother, it seemed truly providential! Determined to design something "different", but classic enough to hang on a wall throughout a childhood and beyond, I turned for inspiration to the work of artist Maxfield Parrish, one of the greatest American illustrators of the 20th century. His paintings were characterized by "Parrish blue" water and skies, luminescent rocks and hills, and perfect-looking young women draped in flowing, classically-inspired garments. His images blended perfectly the realm of fantasy with that of reality, and were so popular that in the 1920s, one out of every four homes in America had his images hanging on their walls. Recently, there has been a world-wide revival of interest in Parrish's work, which is a fortunate thing for us indeed! This design could easily be altered for the birth of a girl by changing the blues of the lettering and the angels' sashes to shades of dusty rose. Stitching Comments: The most challenging part of this design is centering the lettering in the space provided. I recommend drawing the name and date out on graph paper to get the spacing right, and then, double-checking everything carefully. Although the border may look intimidating, it's not; it's a very simple arrangement of mostly cross stitches and eyelets, and a few lazy-daisy stitches. You will need to maintain even tension when stitching the eyelets for a neat look.